This custom-built 1950s home is set in a peaceful location behind two gated entries. Just minutes from Lake Casitas and downtown Ojai, its South La Luna Avenue location is an ideal choice for commuters or those who enjoy frequenting the beaches of Ventura or the boutiques of Santa Barbara. Spanish influence can be seen throughout the architecture, and it is immediately evident that this home was designed for elegant outdoor living and entertaining. A custom-designed spa and swimming pool with a slide are just the beginning of the outdoor entertaining features, which also include three covered patios, a well-equipped outdoor kitchen with a bar, a rose garden and tons of guest parking. The main outdoor entertaining area is a large, covered patio with a vaulted, exposed beam ceiling and two ceiling fans that is accessed from the kitchen, family room or master bedroom. This spacious area is large enough for a pool table, multiple seating areas and even a bar or additional game table. This terrace is fully fenced with a decorative railing that was designed to keep small children and pets safely on the patio and away from the pool and other areas of the yard, but it can be removed when you want to have the space open to the lower patio and the pool when entertaining. Stepping down from the main entertaining area, there is another covered patio that is home to a particularly well-appointed outdoor kitchen with a long seating bar, two ceiling fans and two refrigerators. 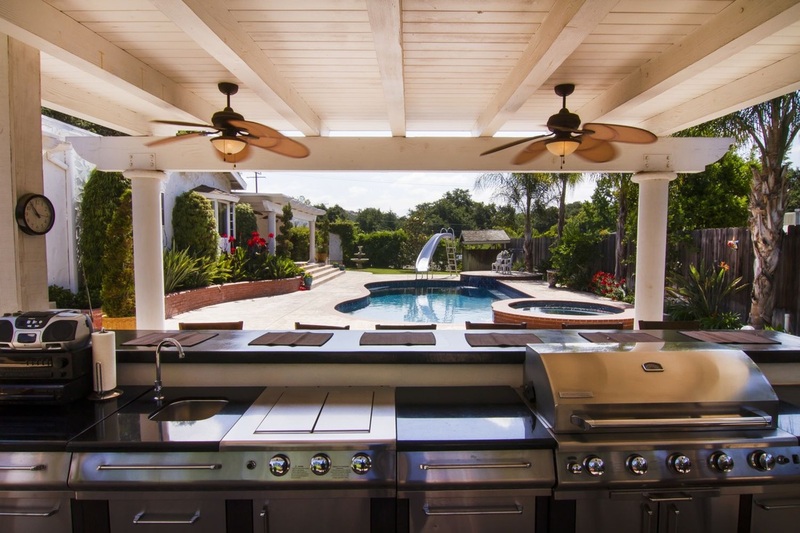 While cooking on the grill, you can chat with guests seated at the bar or keep an eye on children playing in the pool and taking full advantage of the pool’s slide. There is also a seating area adjacent to the slide for parents who might want to relax a little closer to the action. Steps from the pool, there is a third covered patio that can also be accessed from the living room. This more intimate space is where you will likely want to enjoy your morning coffee or catch up with your partner at the end of the day. Behind the outdoor kitchen and main entertaining areas, a picket fence surrounds a lovingly cared for rose garden accessed through a garden arch. A shaded bench in the middle of the garden is the perfect place to steal away with a good book or enjoy the beauty of the garden after tending to the roses. Beside the rose garden, there is a partially covered dog run, and there are two storage buildings on this level. A road curving around the garden leads to a second level that could be used for additional guest parking or transformed into a mediation garden, and then to the lower level where you will find the brick, four-stall, shed row barn for your horses, car collection or motorcycles. The tack room is currently showing its versatility for being used as a workshop, and there is also a wash rack and chicken coop nearby. Fruit trees on the property include apricot, orange, lemon, plum, peach, nectarine, apple, pear and lime. Of course, there are also plenty of mature oak trees dotting the property as well. When entertaining large crowds or long-term guests with RVs, you will also be happy to know that the pool area can be accessed from the front parking area without going through the house. This front parking area is also where you will find the RV parking area with a 30-amp electrical hookup. There is one more outdoor living space we haven’t mentioned yet: the courtyard leading to the home’s main entry. From the front parking area and two-car garage, an arched entryway opens to a covered, brick walkway leading through the courtyard to the front door. This private patio area is a lovely place to greet guests, but it can also act as a private getaway, since it is separate from the other outdoor entertaining spaces. From the courtyard, you step through the main entry into a large living room with an exposed beam ceiling and French doors leading to a covered patio and the swimming pool. The remodeled country kitchen is just beyond the living room and features an island with a produce sink and breakfast bar, wood floor, granite counter tops and plenty of storage. As you work in the kitchen, you can hear the waterfalls flowing into the swimming pool and conveniently keep an eye on laundry in the nearby laundry room with a sink, storage and lots of pantry space. The kitchen opens to the dining room for easy entertaining, and a door from the dining room leads to the main outdoor entertaining area. This covered patio can also be accessed through French doors in the family room, which has a ceiling fan, wood-burning stove and an office alcove. The large master bedroom also connects to the main outdoor living area and has a custom-designed, over-sized, walk-in closet with built-in shelving and drawers. A guest bath with a double sink is just steps away, and a second bedroom with an en suite bathroom provides a comfortable space for short- or long-term guests. For those who need a home office or hobby area, there is an additional room in the garage offering even more space. This thoughtfully laid out home is a great choice for someone looking for a tranquil retreat where you can enjoy the mountain views and host large gatherings of family or friends. From here, you can walk to the local produce stand, ride your bike to the Ojai Valley Trail and take advantage of this central location that allows you to easily access Lake Casitas, downtown Ojai and the beaches of Ventura.